For premium quality bridges and crowns in Marietta, trust the professionals at Mansouri Family Dental Care & Associates. We are a comprehensive dental practice serving children and adults in Marietta and the surrounding areas. Our dentists, Drs. Azita A. and Michael S. Mansouri, are highly trained and experienced in placing crowns and bridges, and use crowns and bridges constructed of only the finest materials. Using these restorative dental procedures, we are able to create beautiful, healthy, long-lasting smiles. If you live in East Cobb and are in need of tooth repair, call Mansouri Family Dental Care & Associates. Our family dental practice offers a full range of restorative dental services including high quality crowns and bridges. If you have a tooth that has been damaged or weakened due to decay, disease or trauma, a crown may be placed over the tooth to restore its shape, size, strength and appearance. Dental crowns are available in pure porcelain or composite, metal or a combination of these materials. They all differ in durability, strength, appearance and cost. One of our talented dentists can go over the different types of materials available and help determine the best type of crown to suit both your needs and your budget. 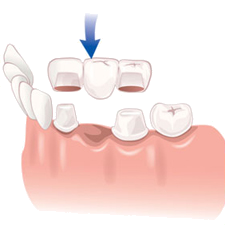 If you are missing a tooth or multiple teeth, a bridge may be used to span the empty space in your mouth. Our dentists use bridges that are constructed of a strong metal alloy that is fused with tooth-like porcelain to give them both durability and a natural appearance. For bridges and crowns done right in Marietta, you can count on the experts at Mansouri Family Dental Care & Associates. Our dental practice is currently accepting new patients and we accept most forms of dental insurance. We also welcome patients without dental insurance. Please contact our Marietta Bridges & Crowns Experts today to schedule an appointment with one of our experienced dentists. We thank you for allowing us to take care of your dental needs and we look forward to exceeding your expectations.